Ian Fleming can finally rest in peace. The lawsuit that began in 1961 regarding the rights and ownership to parts of the James Bond franchise has finally ended. The legal battle began when Ian Fleming used part of a screenplay he’d co-authored with Kevin McClory to write the novel Thunderball. In 1961, McClory sued over ownership rights, rights that Fleming had sold to EON/MGM to produce the James Bond films based on his novels. In 1983, a London court permitted McClory the rights to produce his own James Bond novel based on the screenplay he and Fleming and written (before any of the actual James Bond movies had been produced). That movie became Never Say Never Again. In 2001, a California court dismissed McClory’s claim to royalties because he’d waited too long to make his case. After more than 50 years, MGM/Danjaq, LLC has finally ended the dispute by making an undisclosed settlement to acquire all outstanding rights from McClory’s holding company, a company now run by his heirs (McClory passed in 2006). Friends and family attributed Fleming’s rapid decline in health to the stress brought about by the McClory lawsuit. As a result, Bond fans have long demonized McClory (and probably with good reason), but the most apparent outcome of the whole disagreement was that EON’s James Bond series lost the use of SPECTRE organization and the Blofeld character, who was unceremoniously executed in For Your Eyes Only as a parting gesture (a middle finger?) to McClory. Now, with the rights to Blofeld and SPECTRE restored, fans are suggesting (some demanding!) that Blofeld and SPECTRE might return in Bond 24 and/or beyond. If you’ve hung on my every tweet regarding the future of the Bond franchise, you’ve probably read my pleas for Bond 24 to regain some of the “smug” and humor that graced the series throughout its history. Craig’s Bond has been put through the ringer. He’s been tortured. He’s watched loved ones die — his lover and his mother figure. He’s gone off the reservation in the name of revenge and lived to tell about it. He’s starred in three relatively bleak movies and done his share of T-Dalt-inspired smoldering. Craig hasn’t had the change to have some good, old fashioned Bond fun. Skis. Winter sports. Puns and wit worthy of a Roger Moore eyebrow raise. Serial womanizing and gawking of which Connery would be proud. Even Dalton got to go sledding in a cello case. But in addition to all of this, I desperately want EON to capitalize on the build-up of the QUANTUM shadow organization as established in Casino Royale and Quantum of Solace but abandoned in Skyfall. What this means, more acutely, is this: Just Say No to the Return of Blofeld. Book Blofeld frightened through unlimited power and connections. He was an imposing, mysterious figure of menace. Movie Blofeld became a joke. The only Blofeld that was worth anything was Telly Savalas in On Her Majesty’s Secret Service but even he didn’t really capture the menace. EON executed Blofeld in For Your Eyes Only with good reason. Even though they couldn’t legally use him anymore, Blofeld had overstayed his welcome. Two of my least favorite Bond movies showcased Blofeld as the primary villain: You Only Live Twice and Diamonds Are Forever. In one Donald Pleasance played him as a cartoon and in the other Charles Gray dressed in drag and couldn’t have frightened a jittery chihuahua. Blofeld should have been dismissed in the post-OHMSS revenge plot that never happened. But we’re beyond that. We’re beyond Blofeld and SPECTRE, and Craigers’ Bond still has unsettled debts with QUANTUM. QUANTUM was responsible for the death of Vesper Lynd. A new villain behind that organization should emerge. 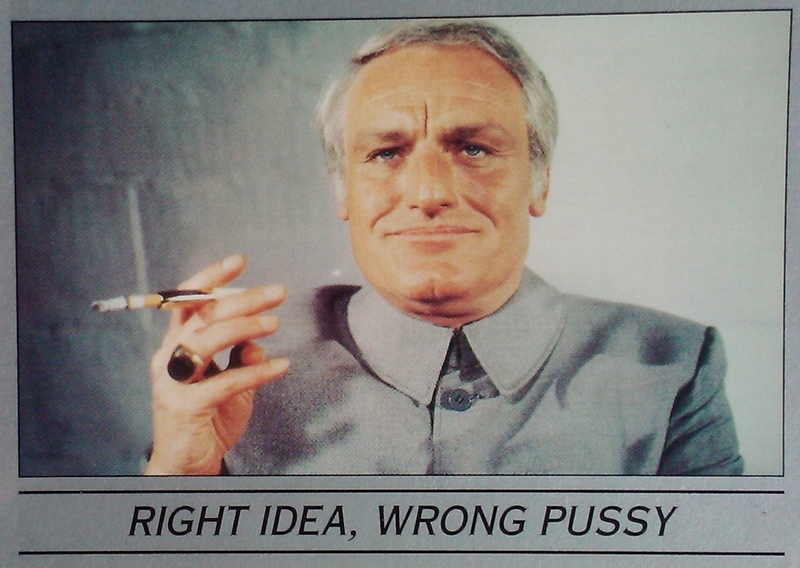 A new villain would finally put the rumors of Neo-Blofeld to bed (as if dropping him down a smokestack wasn’t enough). It would not be impossible for QUANTUM to turn out to be SPECTRE with Blofeld at the helm, but this twist would be a disingenuous, forced narrative twist that would only pander to nostalgic fans. QUANTUM has been established as a new shadow organization for a new Bond era. They know that we know that QUANTUM was never set up to be SPECTRE. Let’s not turn back the clock to relive the embarrassing missteps of Bond movies past. I’m on the verge of being able to order the entire Bond franchise into a reasonable timeline that considers the major plot points, actors playing Bond in different stages of his career. Reintroducing Blofeld/SPECTRE in the Craig era (post-Skyfall, anyway) means major snafus. We already have the “Blofeld doesn’t recognize Bond in On Her Majesty’s Secret Service” situation to deal with.